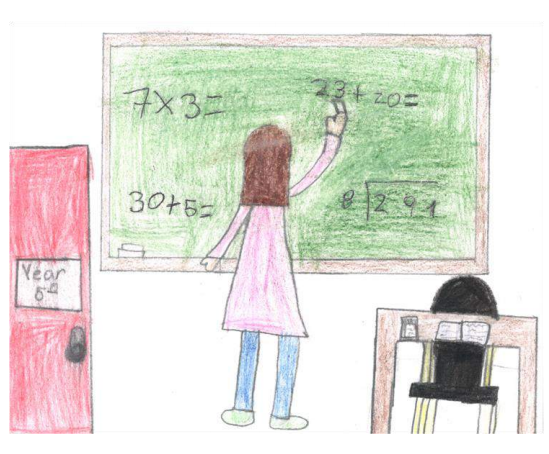 Image credit: Education and Employers, "Drawing the Future"
Faced with teacher shortages, recruitment challenges, and concerns about the social standing of the teaching profession, policy makers need to design strategies to attract more, better-qualified candidates to the teaching profession. But before doing that, they need to know who tomorrow’s teachers might be. In 2015, the PISA survey asked 15-year-old students the following forward-looking question: “What kind of job do you expect to have when you are about 30 years old?” Our new report, Effective Teacher Policies: Insights from PISA, reveals some enlightening findings. On average across OECD countries, about 4.4% of 15-year-old students expect to work as teachers. By comparison, the number of teachers in primary, lower secondary and upper secondary education represents about 2.4% of the labour force across OECD countries. This means that the share of students expecting a teaching career is generally larger than the share of working-age people who are actually teaching today. This suggests that education systems could do more to encourage students to pursue a career in teaching. Teaching’s initial popularity among school-age children is not that surprising considering that the profession, like healthcare, enjoys one clear advantage over other occupations: all 15-year-olds know that this occupation exists. They have all had some contact with teachers, and they have at least a general idea of what they do and what their working conditions are like. The more an education system is able to raise the skills of its students, the more likely it is to create future generations of highly skilled teachers. At the same time, about 46% of students in OECD countries expect to pursue a career as some other type of non-teaching professional: high-status jobs that typically require a university degree, such as doctors and lawyers. Yet in many countries, students who expect to work as teachers have poorer mathematics and reading skills than those who expect to work in these other professions. Interestingly, the skill gap between students who expect a career in teaching and those who expect a career as professionals tends to be larger in low-performing countries. In other words, there seems to be an opportunity for a virtuous cycle: highly skilled teachers are needed to meet the challenge of educating future generations, while also attracting more motivated candidates to the profession. At the same time, the more an education system is able to raise the skills of its students, the more likely it is to create future generations of highly skilled teachers. School systems often aim to recruit their teachers out of the same pool from which all of the top professionals are recruited. But people who see themselves as candidates for those professions, and are attracted to the working conditions enjoyed by professionals, might not find what they’re looking for in schools that use an overly bureaucratic management structure to direct teachers’ work. Transforming the work organisation of schools, involving teachers in school decision making and enhancing their leadership responsibilities are at least as important as increasing teacher salaries. Media campaigns to enhance the image of the profession – by highlighting its importance for the nation, its sophistication and complexity, and the intellectual excitement it can generate – can also be a great help. “What would you like to be when you grow up?” is no throwaway question. The answers are symptomatic of the virtuous or vicious nature of the education cycle in a given system. So what can policy makers do to enter or pursue a virtuous cycle? Our new report on effective teacher policies discusses this and recommends important levers for promoting teaching as a demanding, rewarding and fulfilling profession. Teaching in Focus #22: Who wants to become a teacher and why?